The week after Thanksgiving, I had the wonderful opportunity to have breakfast with Dr. Julin Maloof (UC Davis), together with other active members of The Pub Club. He was visiting MSU as guest speaker of the Plant Biology/Plant Research Lab Seminar Series. During breakfast, we discussed a range of topics from the scientific (“shade avoidance networks” and “plant developmental biology”) to the mundane (“climate differences between Michigan and California”). What struck me the most was how an established researcher like Julin started out just like any junior researcher like me and, in a way, still encounters similar daily struggles. 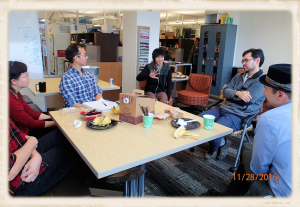 As he was surrounded by enthusiastic postdocs and grad students, we probed him with a lot of questions regarding successful career development. 1. Challenge yourself and do not be afraid to change fields. Julin himself did his graduate studies on the model worm C. elegans before switching to plants for his postdoctoral work with Dr. Joanne Chory at the Salk Institute. This turned out to be an exciting adventure for him as he was able to explore a new model organism while bringing fresh perspectives from his C. elegans background. This “switch” all started with a colleague handing him an interesting review paper about plants. Indeed, bravery and audacity are rewarded in science as Julin is now one of the established names in plant developmental biology. 2. Be bold, be strategic and be excited. Although Julin was initially wait-listed as a postdoc when he first proposed a “safe” research topic, he then wrote Joanne back about the research that he was really passionate about. This bold strategy paid off in spades as this led to a golden ticket of a postdoctoral interview. His anecdote is a very important reminder that we scientists need to be strategic in every step of our career – from which questions to pursue, which experiments to conduct, which collaborations to foster and which projects to drive. However, Julin stressed that we should never stop doing what excites us for the sake of strategy. After all, science is a big part of our lives and we would not want to invest in something that does not excite our passions. 3. The postdoc period is for career development and not career “avoidance.” Julin realized that he was ready to move on from his postdoc program once he had developed the necessary skills and output to become an independent investigator. Around that time, he assessed that he could be competitive with the incoming faculty search candidates at Salk. Although having a strong publication record was important for Julin to be ready to pursue an assistant professorship, this was not the only factor. Julin knew that he had developed the “Diverse Skills” necessary to arm himself for the challenges and demands of academia. Just as being a postdoc is different from being a grad student, being a PI is way different than being a postdoc. Enhancing these diverse skills (from organization to communication to leadership) and having the confidence to evaluate oneself to be capable of these skills are important to make that next big step. 4. Being a PI is an ongoing process not a fixed destination. Working as a professor has been a continuing education for Julin. Just like in any other career path, it is important to take advantage of career development opportunities, especially in relation to personnel management (“mentor some undergrads or rotation students”), grant writing (“ask your PI if you can co-write a grant”) and teaching (“take those teaching class opportunities”). It would be counterproductive to view the professorship as an end with no moving forward. We must always pursue to grow at whatever stage of our career we are in, or we risk the dangers of stagnation. Stagnation leads to indifference, and indifference could lead to contempt. Just as the philosopher Friedrich Hegel expounded on the eternal dialectic of ideas, we must view our careers as an ongoing dialectical process of self-correction and continued growth. As I contemplate on these four themes, I realize that being a scientist will always be challenging. It is never easy and will never be. Although, what is a life of “easy” but a stasis of boredom and ennui? Science is not easy. Being a scientist is not easy. But instead of fearing this realization, we should embrace it. Challenge is exciting! Generating new ideas is a tumultuous process. Working in the frontier means being at the edge of the known and pushing into the void of the unknown. And isn’t that what we are here for?